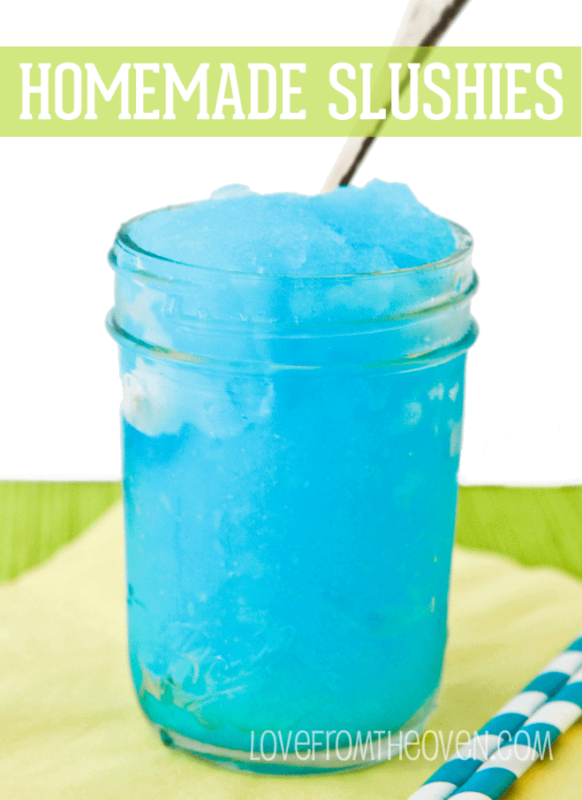 Let’s talk homemade slushees, delicious and easy homemade slushies to be exact! One my daughter’s all time favorite treats is a blue raspberry slushie (or is that slushee, I never quite know). There is a little snow cone place near our home and she’s always finding ways to convince me that we need to go get snow cones. They are great, I’ll give her that, but I kind of want to fall over every time I pay over $4 for what is basically a cup of ice. And then there is the issue of the bright blue tongue and lips which make her look like she has hypothermia, and make me feel like I need to call the dentist. I figured there had to be a better way. And there is! Oh yeah! 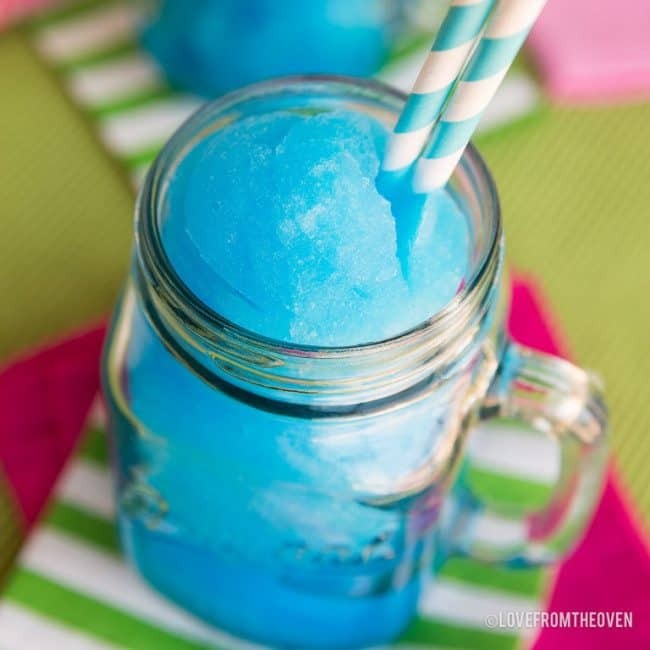 Fabulous homemade blue raspberry slushies that have been declared “the best ever” by a very honest and incredibly picky ten year old. Woohoo! I have to admit, these turned out all kinds of awesome and are super easy. When I recently found some McCormick’s Raspberry Extract at my grocery store, I knew I had to try and create a fun, summery, frozen drink with it. I am so thrilled with the results. 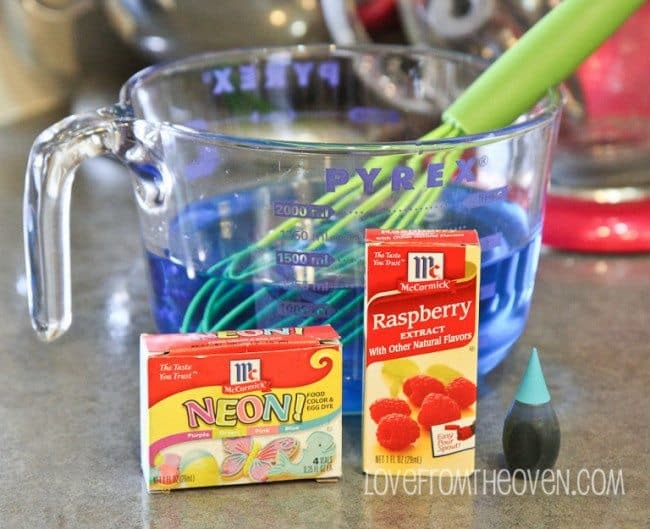 This recipe only calls for four ingredients… Water, sugar, McCormick Raspberry Extract and McCormick Food Coloring. My daughter picked the Neon Blue food coloring, but the regular blue would work as well. 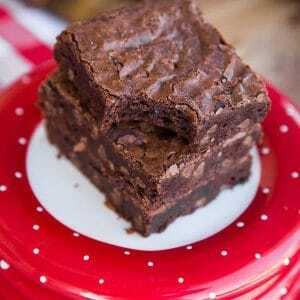 You can also make this without any food coloring. I used my ice cream maker to make these, and let me tell you, it is ALL kinds of awesome for this. How I haven’t tried it before is beyond me. It makes PERFECT homemade slushees! All of the ingredients are mixed up, then into the ice cream maker they go for 20 minutes. And out came the perfect slushee consistency. This made four servings, about one cup a piece. The flavor was perfect and I loved that my daughter’s mouth and teeth were not some crazy shade of blue after she enjoyed her treat. It’s nice to be able to control the amount of food coloring in it. If you don’t have an ice cream maker and have considered getting one, go for it. They are so easy to use, and I keep finding more ways to use mine (in addition to crazy delicious homemade ice cream). 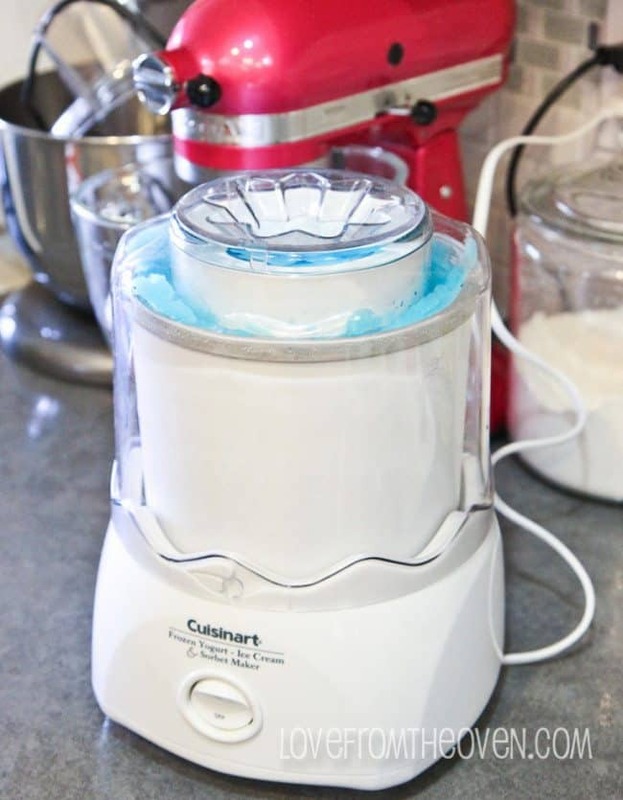 I have the Cuisinart Ice 20 1 1/2 Quart Machine and there is a newer model out for like $2 more that comes in lots of fun colors. If you want to make one without an ice cream maker I would try replacing two of the cups of water with ice, and making it in the blender. I haven’t tried that myself, so if anyone does, let me know how it goes. 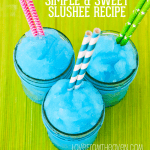 This simple and delicious slushee recipe is quick to make and very inexpensive! A perfect treat for those hot summer days. 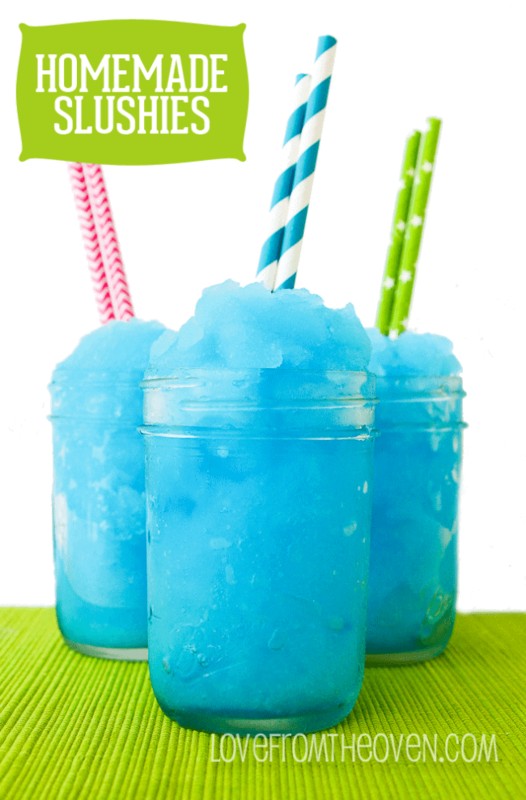 While made in a shade of blue, feel free to use your favorite color for this fun treat. In a large bowl, combine water and sugar and stir until sugar is completely dissolved. Add in McCormick Raspberry Extract and stir well. Follow with 4-6 drops of McCormick Food Coloring to achieve your desired color. Stir well. Pour into your ice cream maker (this recipe was tested in a 1 and 1/2 quart ice cream maker) and turn on and run according to ice cream maker package directions. Let run for approximately 20 minutes or until desired consistency is reached. Serve immediately. Per the instructions that came with my ice cream maker, I freeze the ice cream drum for at least 24 hours prior to use. If I have room in my freezer, I actually store the drum there (empty) when not in use to allow it to be ready to use when I want to make ice cream or slushies. So much fun! I think next I’m going to try a vanilla version, which is what I typically get at the Snow Cone place we go. Though coconut and lemon sound pretty tasty as well, or even root beer! I’m sure we will be experimenting with this recipe quite a bit this summer. I might even have to try making margaritas in the ice cream maker. 🙂 Cheers! Cute straws can be found at Sweets & Treats Boutique. 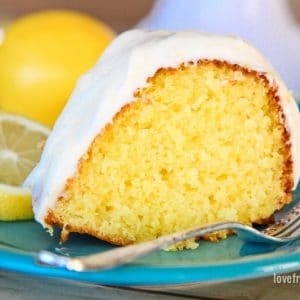 I saw you Instagram this earlier and I have patiently been waiting for the recipe. I can’t wait to try this. I got an ice cream maker for my birthday last year and this will be the perfect recipe to try first! Karissa, it’s so easy! I can’t wait to try some other varieties as well. 🙂 Enjoy your ice cream maker, I let mine sit forever and now I can’t get enough of it. My parents were recently given a Krupps ice cream maker and it is the BOMB! We were used to the old-school ones that are as loud as a dump truck and take forever. This thing is so easy to use. We will definitely be making these slushees. What other ice cream maker recipes ya got? 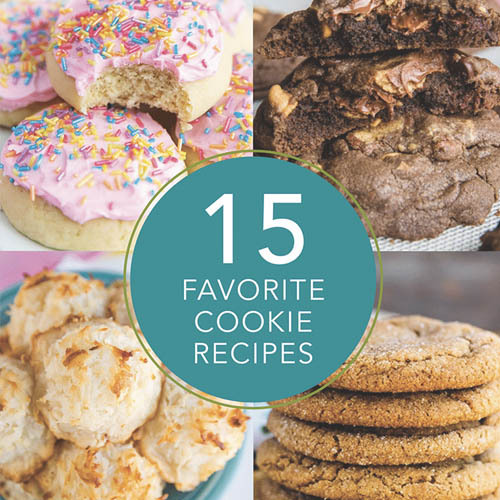 Shannon, here you go… https://www.lovefromtheoven.com/tag/ice-cream/ The deep dark and delicious chocolate one is incredible, and the vanilla based ones are super easy. Have fun! Oh my gosh. 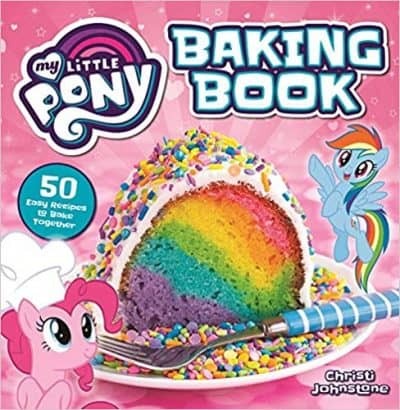 My daughter is going to freak out when I make these. Thank you! Pinned. I saw your pic on Instagram and could not wait for the recipe!!! I told my kids and they were all super excited. Since school let out my girls and I randomly jump up and down yelling summer summer as my son just watches us! 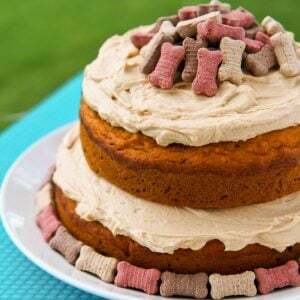 This recipe gets a lot of jumping up and downs from us all!!! I’m totally loving this idea using an ice cream maker! You really are the bomb. Olivia would love this. We just went a few weeks ago and got her first snow cone and she loved it. I’m definitely going to have to do this for her and even experiment with the whole ice cream stuffed cones too. I’m a newbie and this sounds so good to me! I’ve never really been a fan of them, but stuffed with ice cream – how could i resist?!? Margaritas oh yes. Oh yes. I’ve been toying with the idea of getting an ice cream maker and you have convinced me. My daughter is always wanting Sonic slushes. 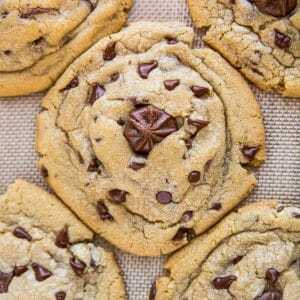 These will be perfect to make at home!! I love the idea of coconut, root bear and vanilla!! Thanks for the awesome recipe!! Made these, super yummy but I didn’t get anywhere near enough to fill a mason jar for three people! Katie, what size mason jars did you use? I have the half pint, 8 oz I believe. Was right about four cups into the recipe, four cups out. I have an slushie maker! 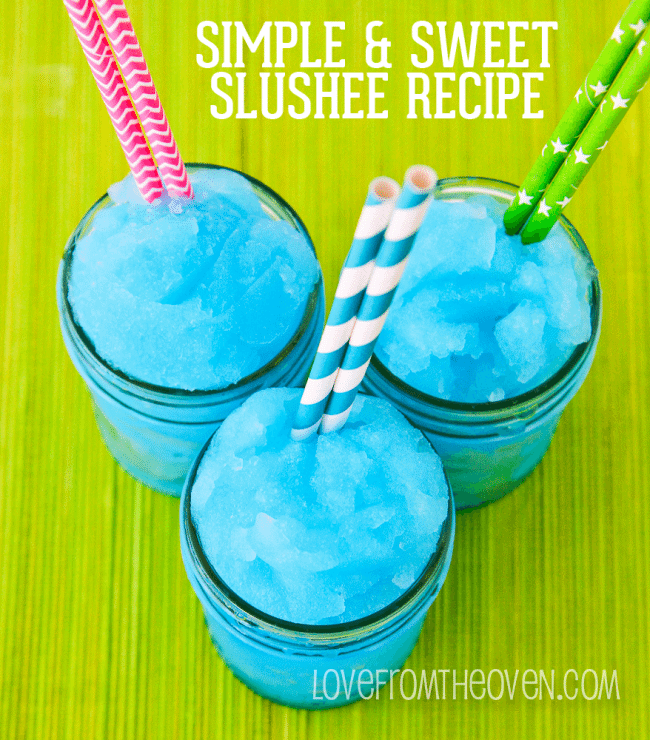 What would you do different to just make slushie mix to go over the ice?? Sounds yummy!!! Megan, hmm. I’m thinking you need to cut back on the water, just not positive how much. I’d maybe try cutting the water in half to try it. I’d leave the coloring and extract the same. Let me know if you try it, I’d love to hear your feedback on how it works as more of a snow cone topping. This great! 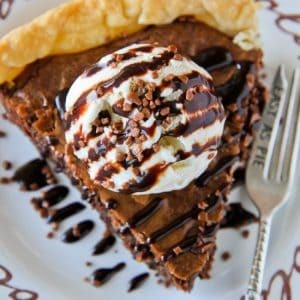 I am going to showcase this on my Facebook page https://www.facebook.com/SeductionInTheKitchen you are welcome anytime to post your photo and post links on it! I wanted to say thanks for sharing this – I just made a batch today and am so glad I did. This was the perfect activity to do with my 5 year old on a hot, humid day. Made these today because I love slushes on a hot day. I left out the food coloring and called it “White raspberry” slushes. I thought if 1 1/2 teaspoon of extract was good, 2 teaspoons would be better- not true. Stick with 1 1/2. Delicious and addicting! I’ve been out slaving in the hot Texas sun working on draining & cleaning our pool and remember seeing this pin & thought “just what I need to cool off”. So yummy! Made it in my blender. Very good, but will reduce to one cup of water next time. but if you let it run in the ice cream maker wont it just stay as water? Laranya, I think the photos pretty clearly illustrate that no, it does not remain water. Clever! 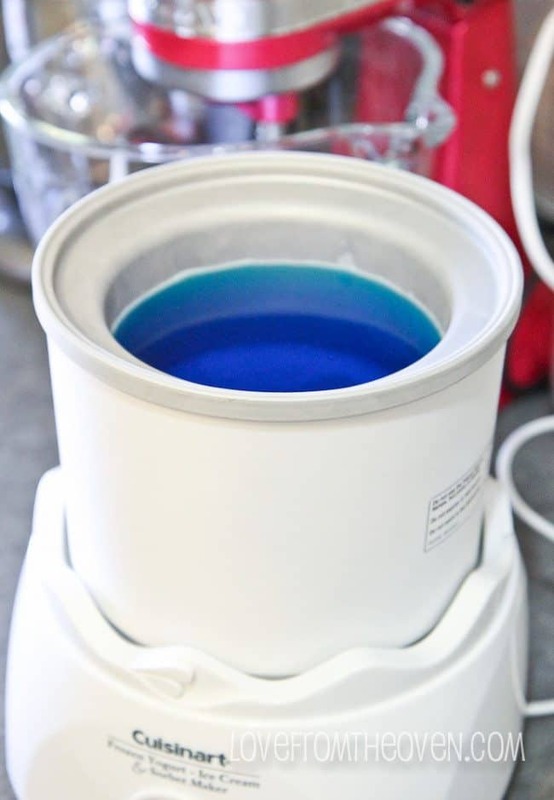 I never knew I could use my ice cream maker to mix up slushies! My husband is going to go crazy for this. THANK YOU!! Pinning. Your absolutely right about the $3 bucks or more….plus gas. I find I go out of my way for the kids and now grandkids. THANK with a capital T, for this one. ( I actually prefer the blue raspberry myself) but feel a little silly with a blue mouth at my age. Thank again. Can’t wait to try this! Did you freeze the ice cream drum first before you started to the slushie? Sonya, yes, per the instructions that came with my ice cream maker, I always freeze it for at least 24 hours prior to use. I actually store mine in the freezer most of the time. Christi, if I freeze my ice-cream maker overnight, then use it make the 4 cup slushies as per your recipe, which will be for 4 people, will I be able to continue to make more slushies, or do I have to refreeze the drum again. 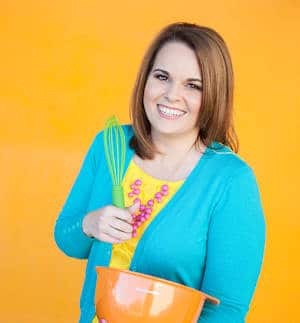 I actually want to make 17 slushies for a teenager’s birthday party and am not sure I’ll be able to make that many if the drum has to be returned to the freezer. Lynn, I haven’t tried doing more than a batch, but honestly I think 17 is going to be really hard with a small ice cream maker. The drum being frozen is what does all the magic, so it’s going to quickly start loosing efficiency. I think you’d either need multiple ones (maybe see if friends/family have some you could borrow) or even look at a large old fashioned style machine. I really only use my drum to make a single batch of anything and refreeze for at least 24 hours. Not saying it won’t work, but I wouldn’t want to count on it for a party. So like, how do you stir the water together with the sugar? Like, would a rubber spatula work well enough, in a large bowl? And how do you transfer it into the ice cream maker from the large bowl? A funnel? I bought one of these things based on your article and the freezer bowl is freezing, so if you could let me know by tomorrow morning, that’d be great, thanks. Himbo, yes, just a big enough bowl and spoon of any type. I just pour straight from my bowl into my ice cream maker freezer bowl, but I’m sure you could use a funnel if you like. Enjoy! i dont know what color im going to do it but its for a girl sleepover also for boys tooo.i hope i could try two colors. Hope it went well!! Your comment was posted on my birthday ? I tried this with a blender but instead of water, add about 2 cups of ice and it tasted the same. ? 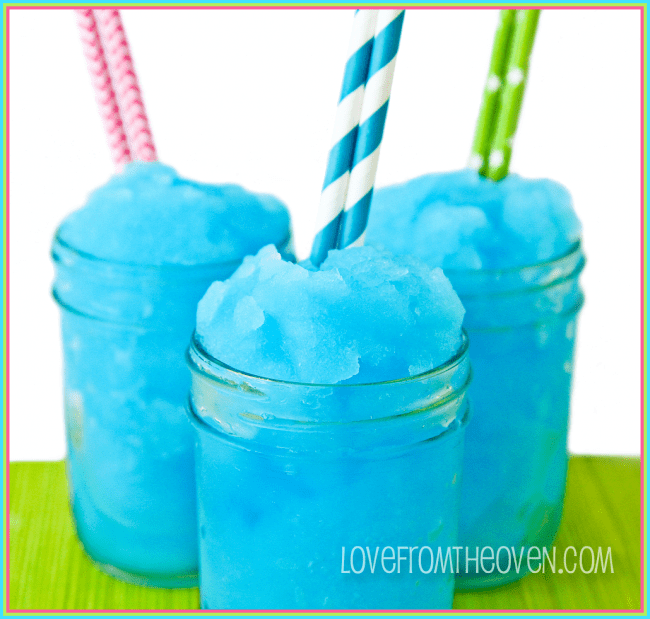 OMG, Christi, blue raspberry slushies were one of my absolute favorite frozen treats growing up! They were the best! I’ve outgrown them at this point :), but this seems like a great treat to make my nephews the next time they’re over. Thanks for the recipe! Have you tried any other sugar or sweetener? We don’t use white sugar so I’m curious if there’s a sub. Hi Heather, I haven’t, but I’m not sure it will work the same. Sugar freezes up pretty easily and predictably, where other substances probably have a lot more variability. No reason you can’t give it a try! Perfect for the hot summer ahead of us! I dont seem to get my crushed slushies right with my professional home slushie maker. No insyruction manual how to go about it. Even checked their website. Nothing. Please someone, help? Its a Moulinex model. Blue and white. Sorry I’m not familiar with that machine. 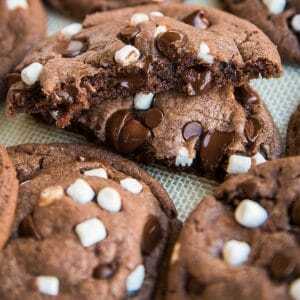 Hi Loved your recipe. Now I’m definitely going to buy an ice cream maker. I someone once turned on to putting a shot of Jack Daniels Whisky into the blueberry water ices .FANTASTIC .Not what you would expect but now I can’t do without .,Thanks for,the great recipe. Thank you so much for this recipe! Had to tweak it as the first time I put far too much liquid in! (I forgot that I’m British, not American, and a 1.2 quart machine would be 1.7litres… when my poor I’ve cream machine only holds 1l (0.8 quarts!) so with that on my mind I’ve only used 2 cups this time! Husbands happy as this is my 2nd pregnancy with a slush craving, but this is much much easier on the bank account! This looks great! 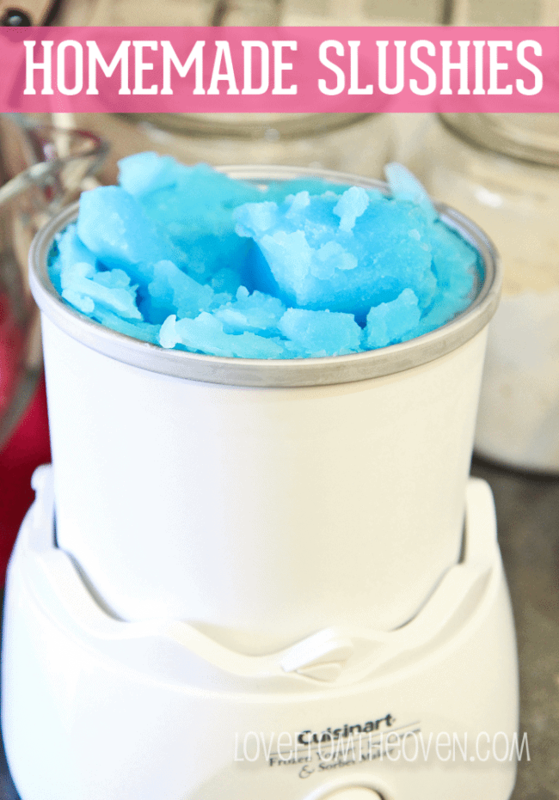 I have fond memories of the slushies we had in our youth, however, I don’t need the extra calories so I sprinkle a small amount of Crystal Light on crushed ice instead of sugar and extract. If you try it you should know that a little goes a very long way. I can have as many slushies as I wish and not only are they a guilt-free 5 calories – they keep you hydrated as well. Enjoy! Wow- I will try this! Thanks for the article! I tried this in a Vitamix. It didn’t work so well. I ended up with a clump of slushy ice (perfect for making snowballs) in liquid. I’ll have to try it in an ice cream maker. Linda, yeah, I don’t think a Vitamix would work the same. The ice cream maker really is what makes it have that awesome slushee texture.